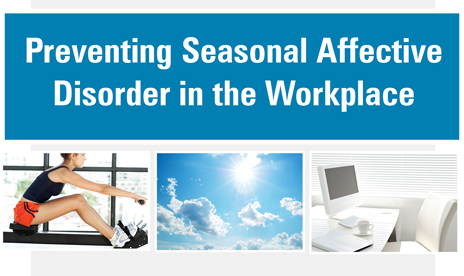 Seasonal affective disorder (SAD) is a recurring depression that affects individuals during the colder winter months and then recedes during spring and summer. Symptoms include difficulty concentrating, low energy and fatigue, a decreased interest in daily activities, moodiness, irritability, and need for increased sleep. The exact cause of SAD is unknown, but it is suspected that an increased level of melatonin in the blood could be a contributing factor among other things. Melatonin enhances the need and desire for sleep, and melatonin levels often increase during the winter months. Arrange your office to maximize the light exposure for your employees. Increase the amount of light in your office by keeping blinds and window treatments open when possible. Encourage your employees to spend some time outside during daylight hours. A short walk during lunch or break time is a great way to increase opportunities for light exposure and can help increase productivity and boost morale. Continue to encourage your employees to participate in regular exercise routines through company-sponsored wellness programs and events. Regular physical activity helps fight fatigue and depression as well as relieve stress and anxiety. Stay in tune with your employees’ personalities and watch for unusual changes or symptoms such as irritability, sleepiness, or interpersonal conflict. As the days get crisper and shorter, you may notice your employees are slacking off on their workout programs. Excuses to not exercise, such as helping kids with their homework or preparing for the holidays, are easy to come by. Here are six tips to help your employees (and your bottom line) stay healthy all year long. 1. Encourage employees to adopt the buddy system: People are more likely to stick to a workout routine when they have someone right there with them fighting the same fight. Buddies provide one another with the encouragement they will need to successfully keep shedding the pounds. 2. Plan wellness events: Employees are more likely to exercise if they have something to work towards such as a group event. Start the winter season out right with a 5K run or walk around Thanksgiving (sometimes called a “turkey trot”). Encourage employees and their family members to attend by offering prizes for winning and participating. 3. Give exercise-oriented holiday gifts: Give your employees a gift that will help them stay fit. If your company employs a high number of people, consider offering a corporate membership at a local gym. 4. Suggest your employees set up a mini-gym at home: Encourage your employees to purchase a stretch band, exercise ball, and a set of dumbbells for their homes. Also, let your employees know about the variety of exercise videos and CDs that can be checked out from the local library. 5. Stock the break room with healthful foods: Implementing a wellness program while keeping the same old candy bar and potato chip vending machine options for your employees sends a mixed message. Try stocking it with low-calorie snacks instead. 6. Always be a team player: Sure, as their boss you are trying to lead your employees toward a healthier lifestyle that will help improve your company’s bottom line. When your employees see that you are right there in the trenches with them, trying to stay healthy, they will feel more like the company as a whole is one big team. 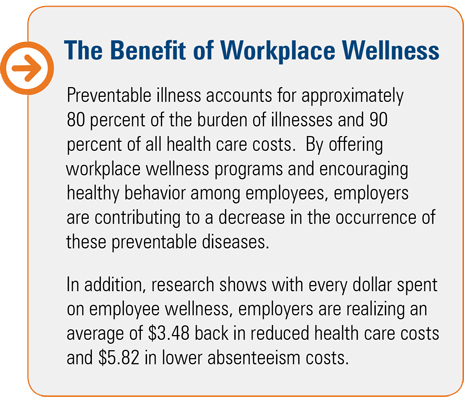 If you pay health insurance for your employees, keeping your employees healthy is your business. We recommend implementing a company-wide fitness program if you don’t already have one—and figuring out creative ways to make employee wellness an all-year-round adventure.